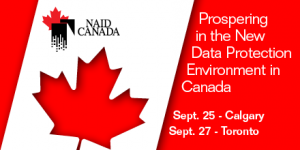 All registrations include the full NAID-Canada Seminar: Prospering in the New Data Protection Environment in Canada on either September 25th or 27th, including sessions and materials. If you are the only individual attending from your NAID Member company. If there are two or more people attending from your NAID Member company. If you are the only individual attending from your company and your company is not a member of NAID, you would select the “Non-Member Individual Registration”. If there are two or more people attending from your company and your company is not a member of NAID, you would select the “Non-Member Group Registration”. Conference registration does not include lodging. In the event this Event is canceled for any reason, NAID will issue a refund for the cost of the registration; NAID shall not be held accountable for any outside fees associated with this cancellation. Are you prepared to capitalize on this opportunity to increase sales and grow your business?